Can you sum up the selling points of your LMS and convey how it stands out from the competition? In this article, I’ll share 8 tips to create the ideal sales pitch for your Learning Management System. For those not familiar with the term, radio-buttons are a group of buttons where only one can be selected and highlighted at a time. They are typically represented as circles and then when selected, filled-in circles. 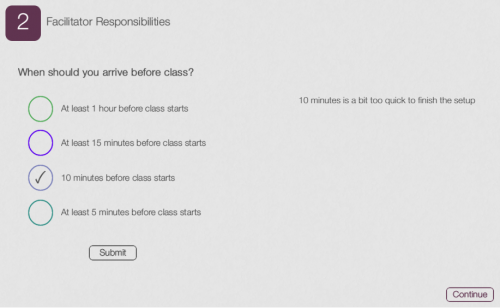 In Captivate, radio buttons appear on quiz selection and look like this. Want to create your own buttons with cool shapes and different colours with minimal coding? Keep reading. I’ve included a sample .cptx file as a demonstration. Create a shape – for example a circle. Tick the box ‘use as button’. Click ‘State View’ and then ‘New State’. Select custom state and title it ‘pressed’. For the new state add another shape or object in the center of your original shape. (For example a check, a smiley face, an ‘x’). If you prefer, delete the ‘rollover’ and ‘down’ views. Duplicate this button as many times as you would like on the page. Click project -> Variables and create a new variable called ‘last’ with no value. And your done! Now all of your buttons will toggle like radio buttons. – I know there are many other methods for achieving this. But if you had dozens of buttons, this might simplify the process. Thanks and if you have any questions please let me know. There are many factors that go into establishing what the spend on your employee onboarding software should be. Take a look at our 5 tips to create a realistic budget to align with your training objectives. Im Rahmen der Finanzierungsrunde zieht sich Mitgründer und Investor Frank Mies als Geschäftsführer aus dem operativen Geschäft zurück und wird in Zukunft im Beirat von quofox beratend und weiterhin als Investor aktiv unterstützen. An seiner Stelle übernimmt Martin Drees als neuer CEO. Martin Drees ist seit über 20 Jahren im Learning-Bereich tätig und dies in einer über zehnjährigen Zusammenarbeit mit Frank Mies und Bernhard König. Er kennt durch seine Branchenkenntnis und seine langjährigen Kundenbeziehungen die Anforderungen des Marktes nach innovativen digitalen Lernlösungen. We can’t have eLearning without content, but that doesn’t mean we have to subject our learners to a series of text-filled screens that equate to a lecture only without the possibility that the presenter will breathe some life into the content with their humor and engaging personality. With the proliferation of online content, games, and other media, there is no place for these mundane, snooze bombs; we need some real page turners instead! Can you hear yourself in this? I’m pretty sure we can all hear one or two things here we say, and have heard in meetings. The next generation of leadership for Cinécraft Productions has been named—Dan Keckan as CEO and Matt Walsh as COO. In diesem Video zeige ich Ihnen, wie Sie mithilfe von Platzhalterobjekten über Folienmaster die Gestaltung und den Inhalt bestimmter Folien vorgeben können.